Flowers and plants have been all-time favorites in wedding decor. However, a new trend is making its way into more and more weddings: potted plants. Placed on each side of the entrance, along ceremony aisles, or used as centerpieces throughout reception venues, plants in beautiful wedding planters can add a touch of sophistication and luxury, while providing more variety and versatility. 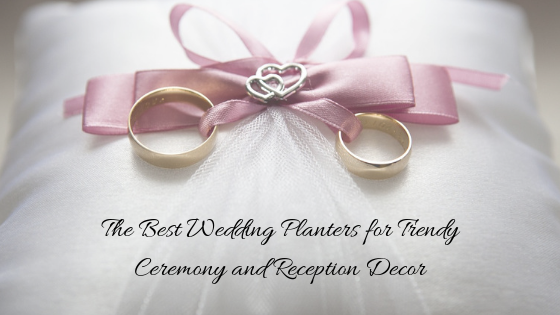 Whether you intend to decorate the wedding venue yourself or to enlist the services of a floral designer, here are some creative ideas on how to use fiberglass wedding planters in order to transform a place into a stunning wedding venue. Fiberglass wedding planters play a pivotal role in creating a romantic atmosphere for your guests as well as a luxurious backdrop for your wedding photos. By combining luxurious flowers, like roses, tulips, lilies, daisies, dahlias and thistles, with lush foliage in stylish fiberglass planters, you can give your wedding decor a romantic, modern feel. Elegant planters, such as the Britz Tall Square Fiberglass Planter and San Jose Ribbed Round Tapered Planter, offer a unique way to create a charming and stylish atmosphere at your wedding. The easiest way to embellish your wedding venue with exotic flower arrangements is to mix and match different tropical plants and blooms with elegant planters. Try to imagine the great effect of exotic flowers like orchids, calla lilies or gardenias combined with small palm trees, philodendrons, alocasias or monsteras, placed in beautiful fiberglass wedding planters suitable for exotic decor. As an example, the Peypin Round Fiberglas Planter, Marseille Round Fiberglass Bowl Planter, Shanghai Fishbowl Round Fiberglass Planter and Spiral Modern Planter are some gorgeous planter options that can perfectly complement any tropical flower arrangements. Some of the fiberglass planters we make available at Planters Et Cetera can also be used to decorate outdoor areas or to create small indoor gardens as part of your wedding decor. For instance, you can use potted trees or tall plants in large containers, like the Bara Jar Planter, as background for shorter plants or flower arrangements in smaller wedding planters, such as the Hayden Fiberglass Planter. For a more consistent look and feel throughout your wedding venue, a great idea would be to choose a specific planter model that comes in various sizes. One such planter is the Lima Tapered Square Planter, which is available in four different sizes that can meet a variety of height and width requirements. For couples who love simple wedding decor, greenery is the way to go. From swags of trailing plants to overflowing leafy displays, greenery wedding styling can deliver a stunning sea of mixed greens. Assorted with massive wedding planters, such as the Hudson Large Rectangular Planter Box or Badalona Fiberglass Planter Box, simple greenery is a relatively inexpensive solution for flanking ceremony aisles and dance floors as well as for designing the perfect background for other flower arrangements. What’s more, pairing plants with fiberglass wedding planters in solid colors really makes greenery have a purpose. Low fiberglass box planters can really make a statement at your wedding. The Bonn Low Rectangle Planter, for instance, can be used to create the illusion of plant and flower arrangements growing naturally from the ground. Because the planter isn’t visible, this type of arrangement provides a gorgeous way of dressing up outdoor areas in particular. Whether you choose rich flower arrangements, simple greenery or greenery with a twist, fiberglass wedding planters can help you create that perfect final touch to style your ceremony and reception venues. At Planters Et Cetera, we offer a wide range of high-quality fiberglass planters that you can use to push the limit of what’s new and different in special event design. The Holidays are here. It’s time to decorate and celebrate with family, friends and co-workers. Every year we “deck the halls” in mostly traditional ways. But have you ever noticed some subtle differences when live plants and trees in fiberglass planters are used to accessorize your decor? Every year, Holiday trees are bought, used for a few weeks, then they land in the recycle shredding machine. During its short visit in your home or office, your tree requires constant care to maintain color. And, oh, those dropped and dying needles! That’s not even considering the purchase price and set up, and dragging it out at the end of the every season. This year, try a live Fraser Fir in a Wannsee extra large planter. Enjoy the fresh smell and look of a live tree with sturdy limbs capable of supporting heavy ornaments. The charm of the majestic Fraser Fir will add refinement to your individuality. At the end of the Holiday Season, simply remove the decorations and place this beautiful tree at an entry way for your enjoyment all year ’round. The fiberglass planters are designed to stay pristine in all weather conditions. Next year, begin pruning your tree by reshaping the branches. Be careful not to trim too much – you don’t want holes in your tree. Now you can be ready for another festive season. The Fraser Fir delivers all of that – without cutting down a tree every year. The tree is decorated, guests are invited, menu is set and now it’s time to decorate. Perhaps it’s time to think “inside the box.” White Poinsettias placed in bright red square or rectangular fiberglass planters will add style to any decor. A high gloss finish will reflect the holiday lights – and your unique style. Placing several around your party area will provide for festive and eye-popping glamour. With some care, Poinsettias too can be kept year round for your next Holiday Season. Another great plant to add to your Holiday Season is the Winterberry Holly Tree. A fast-growing tree that is hardy in almost any environment produces a bright red berry on a bare limb! There’s no greenery to distract from the red color. Place this tree in a tall round white planter for a stunning focal point. This tree can be placed outside in temperatures as low as -30 degrees. Never fear that the planters will freeze and break, or become brittle like terracotta. It’s fiberglass – strong and resilient! The planter will certainly stand up to the challenge and protect the roots of your tree and provide pristine beauty all year long. Amaryllis. The Amaryllis flower blooms at different times of the year. It’s important to pick the right Amaryllis if you want blooms from November to December. Three or more placed in the Reade rectangular planter in colors to compliment your blooms will provide more beauty to your overall decorum. 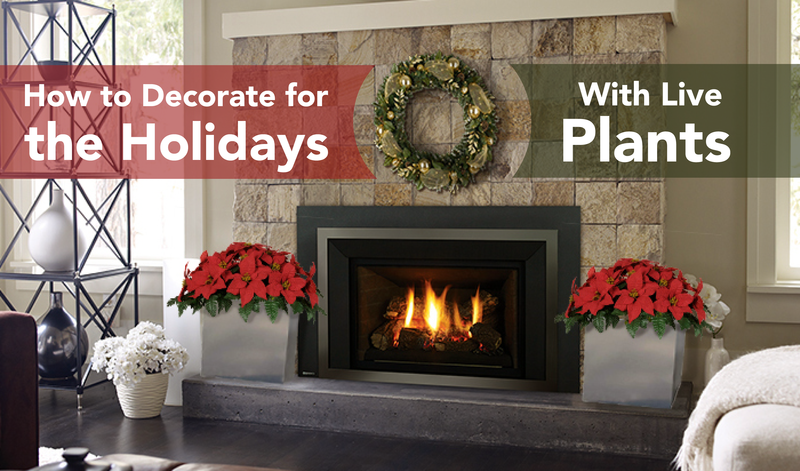 Adding fiberglass planters and live plants to your Holiday traditions will bring elegance and depth to your holiday decor in your home or office for years to come. After all, wouldn’t you rather be celebrating? From all of us at Planters Etc, Happy Holidays! Planters can help extend our inside space into the outdoors by adding beauty and functionality to decks and porches as well as adding curb appeal to the front and sides of your home. Offering many designs, colors and style, every home can be upgraded with flowers and greenery. Did you ever drive by a home and just feel welcomed? Perhap you didn’t realize that part of the great appeal is the warm inviting look of their planters. Outside curb appeal adds so much to the look of your home. Planters, like that of our Niagara design can blend into the home or be a major focal point in the yard. When staging your home to sell, this unique way of changing the outside look of your home can add dollars to your sales price. The planters themselves can be a negotiating item in any sale offers. Another way planters can be used is as room dividers in large spaces. Separating spaces into different areas for specific purposes can take advantage of unused and wasted space. Creating a sitting room or foyer with plants will add dimension and style. Since planters are mobile, they can easily be moved when the larger space is needed for family gatherings and parties in the home. This unique feature allows you to be creative with your design. Today’s busy homeowners believe that “less is more”. However, less furniture and less places for your eyes to “rest”, means the potential is greater for echoes and noises that can make a home environment stressful and tiring. 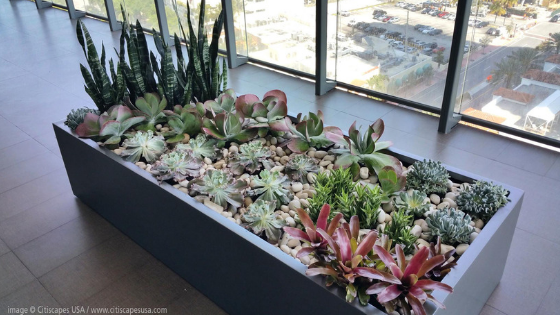 By their sheer existence in a room, planters with plants can help absorb noise. Not wanting to add more work to busy lives, plants requiring little attention would work to serve several purposes while adding beauty and grace to any home. 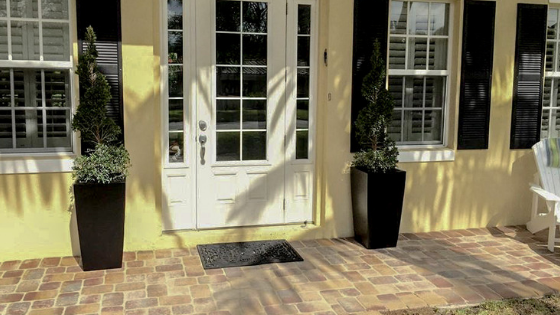 Planters on either (or both) sides of your driveway will add color and allow your unique style to show. Seasonal flowers, or year-round slow-growing trees such as Pine, Juniper, Japanese Maple, and Olive do very well in rectangular containers such as the Narbonne Rectangular Planter Box. Check your Planting “Zone” so that you know what grows best. Keep in mind when lining your driveway of your family’s driving skills! 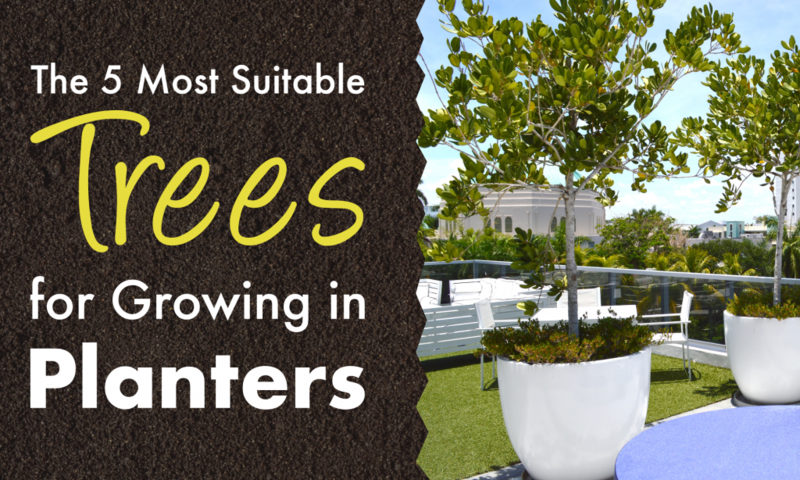 While Planters are strong and durable, they do have limits and so do most automobiles! We love our privacy! In areas where houses are close together, a privacy fence is a must. But it doesn’t have to be unattractive. Planters along the fence will dress up that yard with color and define your particular style. Taller trees surrounded by low ground cover plants, or medium shrubs with grass in the planters like the Tiergarden Rectangular Rail Planter will add new life to an old fence. If no privacy fence exists, why not make one with planters! Consider putting a vegetable garden in the planters for your family to enjoy. Teaching children the joys and rewards of gardening will create memories for a lifetime. So many options await for your unique taste to be displayed. Design your home with planters, both inside and out, and enjoy the wonderful things that plants add to our lives. Limited space does not mean limited choices. Quite the contrary, small apartment balconies or large decks in your yard offer a unique opportunity for an outside living space with charm, and rype and ready vegetables for your table. Fresh vegetables grown in an environment that you control will be rewarding, delicious and fun for the whole family. Monitoring the pesticides and nutrients will provide for a healthy alternative to the vegetables found at the supermarket. An added bonus will be teaching your children the wonderful art of gardening that will bring them memories and skills that last a lifetime. Before you begin, define your style. Fiberglass planters offer many choices. Shorter planters provide easy access for children; taller planters can eliminate bending. Coming in a variety of sizes, shapes, colors and textures, you can mix and match to create an eclectic space or coordinate them in your favorite colors. Lightweight and easy to install, fiberglass containers offer flexibility in designing your outside space, and they beautify any area with style that is uniquely your own. Once you have decided on the style, make sure you know the needs of the vegetables you will be growing. Different vegetables will require different soil types and different drainage requirements. Some require no drainage while others require the soil to be soaked then dried to a damp state. Planters come with or without drain holes allowing water to nourish and drain your plants adequately. The right amount of water will produce the results you desire. Placement of your vegetable garden planters will also be important to be productive and fruitful. For example, root vegetables such as beet and carrots do well in partial shade (direct sun for only a few hours a day); leafy vegetables such as spinach and salad greens thrive well in full shade (no direct sun). There are many types and varieties of vegetables that love full sun. Full sun is considered to be 6-8 hours per day of direct sunlight. Some examples of easy-to-grow and healthy full sun vegetables are tomatoes, peppers, cucumbers, and beans. Tomatoes and peppers require less space, while cucumbers and beans need room to spread out and make vines to support a larger crop. Some vegetables thrive in colder temps while others need the hot summer sun to produce. Your geographic zone will help you determine what grows best in your climate. With fiberglass planters, however, you can “rotate your crops” from season to season and enjoy fresh vegetables of your choice all year long. Armed with information about conditions, sturdy and durable fiberglass planters allow you to control the growing process from the comfort of your own home and enjoy quality fresh vegetables for years and years to come. Happy Growing!